Summary Smartphone-connected cable tester and Ethernet network analyzer. If you install and troubleshoot networks for a living, a handheld cable tester is sure to be part of your field kit. But these devices are usually surprisingly expensive for what they do, typically selling for $300 or more. This was apparently too pricey for a pair of Berlin, Germany engineers, who launched a successful Indiegogo campaign in 2014 to create Pockethernet. Pockethernet is a handheld Ethernet cable and network analysis tool that costs €167 or around $176 at current exchange rates. (The price for EU buyers is €199, which includes 19% VAT.) With this handheld tool, you can run numerous Ethernet cable tests and see the results on your smartphone. Physical level test capabilities include length measurement and failure detection, as well as checking availability of Power over Ethernet (PoE) or phone services on the wire. Layer 2 and above tests include Ethernet link speed, duplex capability, plus network DHCP, DNS, and ping tests. Pockethernet works best with a free smartphone app, yet has some functionality even without the app. Pockethernet communicates through Bluetooth with the app on your smartphone, presenting test results in real-time. Further, results can be exported in PDF format for distribution or record keeping. Shown below are the front and rear images of the device. 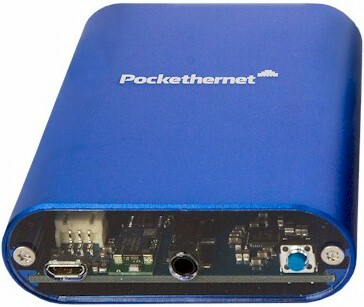 The Pockethernet device is about 3.5" long, 2.5" wide, and 1" high. It's enclosed in a blue metal case with clear plastic panels on the front and back that allows you to see the internal components. The front of the device has an RJ45 Ethernet port and the LEDs. The rear of the device has an on/off button and a micro-USB charging port. Pockethernet comes in a nice carrying pouch with Pockethernet, a remote terminator for Wiremap and BER tests, 50 cm (20") Ethernet jumper cable and USB charging cable. The Pockethernet manual is on line and available on their support page. I found the the light font and white background of the on line manual difficult to read. It would be nice if there was an easier to read downloadable pdf version of the manual as well. You charge the device with the included USB cable connected to a powered USB port. While charging, the power LED is lit and the device is not functional. Pockethernet reports it takes about two hours to fully charge the device. When not charging, the power LED indicates battery status by the color of the LED. The bulk of the functionality of Pockethernet is accessed with the free Pockethernet app. Pockethernet reports the iOS app is compatible with an iPhone 4s or above and the Android app with Android 4.3 or higher. I was able to install it on an iPhone 7 as easily as any other app via iTunes. I connected the app to the Pockethernet device by enabling Bluetooth in the Settings menu of my iPhone and then pressing Connect in the Pockethernet app. No PIN code or other authentication was necessary. Press the on/off button to turn the device on. The device goes through a self test where there are a few audible clicks and the Ethernet LEDs briefly light up. As mentioned in the introduction, you can use Pockethernet as a standalone device. Tapping the on/off button briefly while the device is powered on will trigger a "quick measurement" of an Ethernet cable connected to the Pockethernet device. There are four LEDs on the device that will display the status of each of the four pairs of wires in the Ethernet cable with six different colors, as listed below. I question the usefulness of this feature unless you're carrying a cheat sheet telling you what these colors mean or have them memorized. Tapping the on/off button twice turns on all five of the LEDs, which turns the device into a handy flashlight. For the main functionality, you'll want to use the app. The app has four menus across the top labeled Test, Report, and Tools. On the far right of the app is the menu option to connect/disconnect the Pockethernet device to your smart phone via Bluetooth. Once connected, you can run any of the tests by enabling it on the right side of the menu and tapping the Measure button on the bottom. I ran through each of the tests to see what they produced. Note, I used manufactured Ethernet cables for my tests, I did not use home made cables. I started with running a Wiremap test. This test is helpful for checking the wiring of an Ethernet cable. You run this test by connecting your Ethernet cable from the Pockethernet device to the Wiremap port of the included terminator, tapping the the Test icon on the right of the Wiremap menu in the app and tapping Measure on the bottom of the app. I ran the test with a known good 568B Ethernet cable and the result came back good as shown below. Note the shield in a shielded cable is also checked, which in this case was not present in the cable I tested. I then cut the solid orange wire in my Ethernet cable and ran the same test, producing the result below showing the orange wire was the problem.. Note, it is important to set the Pockethernet tool to 568A or 568B so it provides accurate results. I initially ran the cut-the-wire test on a 568B cable with Pockethernet set to 568A and was told the green wire was bad. Changing the setting to 568B and running the test again provided the accurate result. The app's Tools > Settings menu allows you to select between 568A and 568B, as well as between feet and meters for distance measurement. The PoE test looks for the presence of Power over Ethernet. I connected an Ethernet cable from the Pockethernet device to a PoE port on Zyxel GS1200-8HP switch. The Pockethernet PoE test showed PoE "Voltage present" and 55V available in PoE mode A, shown below. I then connected the same Ethernet cable to a non PoE port and the result correctly showed "No voltage present."